Brave the dangers and go find your comrades to rescue your species! 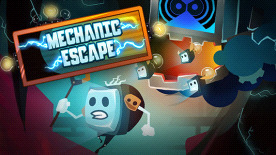 Mechanic escape is a platform game full of infernal chases. In order to find his lost friends, Mech (the hero) doesn't hesitate to play the human cannonball, to pass throughout high-voltage areas or even dodge the most deadly machines. As if that was not enough, many bosses will take a real pleasure in chasing you to stop your insane journey.